Nathaniel and Elizabeth Bartlett. The 1841 census shows that Nathaniel Bartlett was a mason who was then aged about 55. 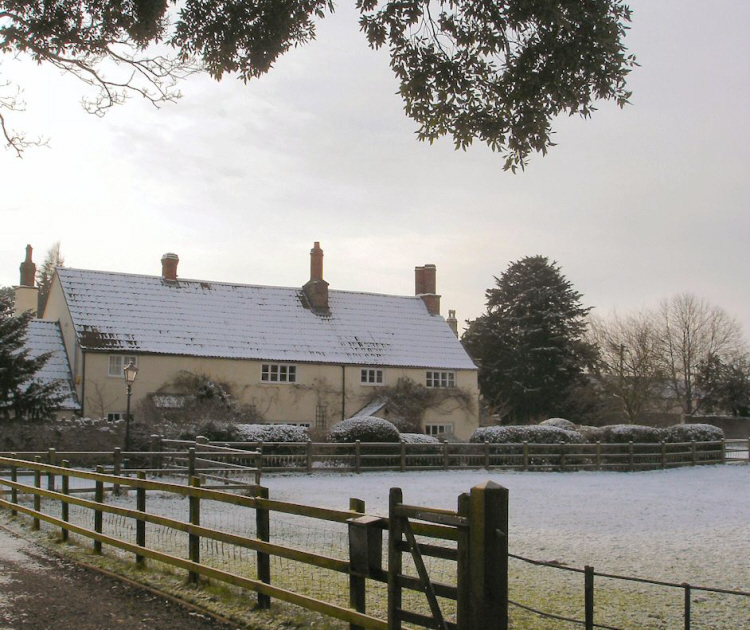 He lived in part of the Old Rectory with his wife Elizabeth. They had a son also called Nathaniel who was also a mason. Their younger children were two daughters Ann aged 15, Maria aged 14 and a son John aged six. We know that Nathaniel’s family had a long link with Thornbury and there are records to show that one Nathaniel Bartlett rented Ogborns field in 1769. Later censuses show that Nathaniel was born in Thornbury. However we have not traced the records of any of this family prior to the baptism of their youngest child John at St Mary’s Church on 28th September 1834. Nathaniel’s wife Elizabeth died aged 57 and was buried in Thornbury on 7th April 1846. Later censuses show that Nathaniel Bartlett was not only a stone mason but the sexton of the church and dug the graves. In 1870 he was still living in the Old Rectory. Nathaniel’s daughter Elizabeth (see below) gave evidence in a case of infanticide in 1872 which referred to the fact that Nathaniel was still the sexton but that he was ill at that time and she was caring for him. Due to his health, Nathaniel’s son, John Bartlett of Crossways, was helping him with the grave digging and this was also mentioned in that article. Nathaniel was buried in St Mary’s Church on 30th September 1874 aged 88. Maria Bartlett. The 1851 census shows that aged 24 Maria had become a house servant in Filton. We know nothing more about her. Elizabeth Bartlett. We know from the census records that Nathaniel had a daughter called Elizabeth born about 1822. She wasn’t at home in the 1841 census, but was there in the 1851 and in the 1861 census when she was described as a laundress aged 39. The 1871 census shows she was living in the workhouse where she was a pauper described as an unmarried laundress aged 48. It was noted that she was ‘insane’, but this must have only been a temporary condition as by 1872 according to the newspaper article she was at home caring for father and giving evidence in court. Please note that terms such as “insane” and “lunatic” were applied to a wide range of conditions that might include depression, epilepsy, strokes etc. Nathaniel Bartlett junior married a widow Rhoda Clark (the daughter of William Ball) on 7th March 1846 in Thornbury. Catherine Gibbs. In 1840 the Old Rectory was divided into two separate households and one was occupied by Catherine Gibbs aged about 50 a pastry cook and Ann aged 17. Catherine had been married to John Gibbs, a collar maker of Thornbury. John Gibbs was baptised in 1799 and was the son of John Gibbs and his wife Ann (nee Penduck) of Thornbury. According to the IGI it seems likely that John Gibbs had married Catherine Martin in Bristol on 29th October 1820. John and Catherine had at least two children: George baptised on 8th December 1822 and Anne baptised on 2nd May 1824. Tragically John Gibbs died aged only 25 and he was buried on 21st August 1824. Catherine was a recipient of the Mayor’s Charity in 1830, 1851 and 1863. Catherine Gibbs and her daughter Ann were still living in Castle Street in the 1851 census but we believe that she had moved from the Rectory and was now at Stokefield Cottages. By this time Anne had become a corset maker. In the 1861 census Catherine was living in one of the Stafford’s Almshouses in St Mary Street. She was described as a widow aged 72 from Bedminster. She was still living there in the 1871 census which also noted that she was partially blind. She died in the Union hospital (the Workhouse) aged 82 on 2nd October 1871. She was buried at St Mary’s Church on 5th October 1871. John and Emma Thurston. By the census of 1871 John Thurston and his wife Emma were living in part of the Old Rectory with Emma’s mother Elizabeth Boulton whilst Nathaniel Bartlett was still living in the other part. John was born in 1843 and was the son of Josiah Thurston and his wife Mary Ann, (the daughter of Simon Slade). Members of the Thurston family were to occupy the property for almost the next 100 years until 1969. The 1851 Census shows that John Thurston was living in Gillingstool near Thornbury with his grandparents, John Thurston a gardener and his wife Rachel a laundress. By the 1861 Census he was aged 18 and an apprentice. He was living with his widowed mother at the Apple Tree Inn Cockmead. Mary Ann was 43 and a beerhouse keeper. He also had a sister Mary. According to the IGI John married Emma Boulton on 26th June 1866 in Bristol. Emma was the daughter of John Boulton and his wife Elizabeth who lived at the Old Rectory. Their first child Henry Josiah Thurston was born soon after their marriage and baptised on 21st October 1866. Henry lived in the Old Rectory all his life (see below). Their second child Alice Azalea Mary was baptised on 1st August 1869 at St Mary’s Church. At the time of the 1871 census John Thurston was aged 28 and a carpenter. His wife Emma was also 28 and their two children Henry Josiah and Alice Azalia were four years and one year respectively. Their third child Bevys Augustus John Thurston was baptised on 23rd July 1879. In the census of 1881 the property was described as Old Rectory House and it was still occupied by John Thurston who was now a carpenter employing one man. John and his wife Emma now had three children; Harry 14 a carpenter’s apprentice, Alice aged 11 a scholar and Bevys aged only one year. Sadly Alice Azalea Mary died on 13th February 1883. John Thurston died in 1886 aged only 43. Initially his widow Emma must have remained in the Old Rectory as her name appears in the Rate Book of 1887. However by the Census of 1891 Emma Thurston then aged 45 and a widow was living in the household of Dr Lionel Henry Williams where she was a servant. 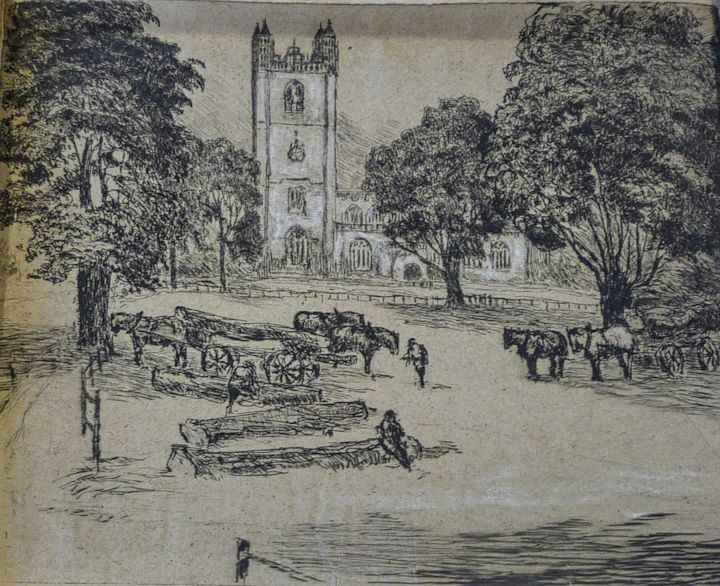 Coincidentally we have a sketch of the glebe land attached to the Old Rectory by Lionel Williams at about this time. On 11th December 1900 Emma Thurston (nee Boulton), the widow of John Thurston married Joseph Gardner. In 1901 the census shows that Emma was living in Leonard Stanley with her new husband Joseph Gardener (sic) who was a baker and his four adult children. The 1911 census shows that she was again widowed and now aged 68. She was still living in Leonard Stanley in Gloucestershire but now with her son Bevys Augustus John Thurston who was a draper’s assistant. Bevys is shown in the photograph above. Emma Gardner was a confectioner and baker. They had a servant called William Bishop aged 24 who was a baker and a visitor Rose Rowcliffe aged 25 who was a draper’s assistant. 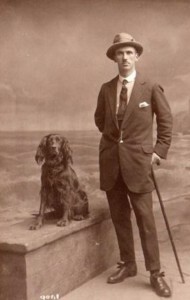 Frederick Parsons. The rate book of 1885 shows that the Old Rectory was still shared by two separate tenants. These were John Thurston (see above) and Frederick Parsons. We know nothing about Frederick Parsons. Mrs White and Hannah Comeley – the 1887 the rate book shows that ‘Mrs White’ was a tenant in part of the Old Rectory and ‘Mrs Thurston’ was in the other part. Mrs Thurston was the widowed Emma Thurston (see above). We believe that “Mrs White” was Hannah White who the same person as ‘Hannah Comeley’ who was living in the house in the 1890 rate book and 1891 census. We are not sure where Hannah was born. The 1871 and 1891 censuses say she was born in Tetbury about 1838. The 1881 census says she was born in Ledbury, Gloucestershire. Earlier censuses show Hannah as being born in Thornbury. The most useful census in establishing Hannah’s identify and earlier life is that of 1871. This shows that Hannah had two son before she married William Comeley in 1870: Edward William White was aged 14 and Tom was aged 4, both born in Thornbury. From this information we are fairly sure that Hannah was the person who at the age of four was living in the Workhouse at the time of the 1841 census. There is no sign of her parents there. She was still listed as an inmate of the Workhouse in the 1851 census. Hannah was then described as a house servant aged 14 born in Thornbury. She was still living in the workhouse when her son, William Edward White was baptised on 27th January 1857. The 1861 census appears to show Hannah had left the Workhouse. She was described as ‘a visitor’ to the Union Cottage a small house (now called Coombe Cottage) just outside the Workhouse entrance occupied by Jacob Mills and his wife. Hannah’s son, William was boarding in the house aged 4. The 1871 census shows William and Hannah living in St Mary Street. William was a labourer aged 23, Hannah was a washerwoman aged 30 from Ledbury. They were living with two of Hannah’s children: Edward William aged 14 and Tom aged 4, both born in Thornbury. William and Hannah Comeley had two children: Alfred Charles baptised on 2nd June 1872 and Lily baptised on 1st November 1874. By the time Lily was baptised, her father had already died. William died aged 26 years and was buried on 17th June 1874. The 1876, 1880 and 1885 rate books show Hannah living in 19 Horseshoe Lane. The 1881 census also Hannah living there with three of her children: Thomas White a labourer aged 15 and Alfred and Lily Comeley aged 9 and 6 respectively. The 1890 rate book shows Hannah had moved to occupy part of The Old Rectory in Castle Street. The census of 1891 shows Hannah Comeley a widowed charwoman aged 51 occupied four rooms of the Old Rectory with her son Alfred aged 18 who was a painter’s labourer. The 1894 rate book shows Hannah is still living there. The 1899 the rate book says that Hannah Comeley had moved to 11 St John Street and the census of 1901 shows that the house was occupied by Hannah Comeley, a widowed charwoman aged 65. Sadly Hannah’s daughter Lily died at Bristol Infirmary on September 11th 1903 aged only 29. The rate book of 1905 shows that Hannah Comeley was still living in the house, but by 1910 she had moved to an almshouse at 7 St Mary Street and she was still there at the time of the 1911 census. We can’t trace when Hannah died. Henry Josiah Thurston was baptised 21 October 1866 the son of the carpenter John Thurston and his wife Emma (see above). The 1871 census shows that aged four he was living with his parents in one of the households in Rectory Cottage. By 1881 aged 14 he was described as a carpenter’s apprentice. Henry remained a carpenter all his life but by 1889 he had a second job description. The trade directories from this time describe him as the parish clerk. In 1886 Henry was listed as a member of the Thornbury Detachment of the 1st Volunteer Battalion of the Gloucester Regiment in 1886. He was still a member in 1888 and 1891 lists. The unit was disbanded in 1895. On 17th December 1890 he married Amy Soule the daughter of a butler called George Soule. Amy was born in Scotland on 13th June1870 and the 1871 census shows her there aged nine months. She was living in Scotland with her mother Millicent and and her siblings George, Millicent, Francis, Harry and Arthur. The 1890 Special Drainage Rate Book shows that Henry took over the tenancy of the house and that he and Mrs Comeley rented it from the vicar, the Reverend Hodgson. In 1891 the census described the house as Old Rectory Cottage. Henry then aged 24 was still living in the home he grew up in. He occupied four rooms with his wife Amy. In 1891 Amy had their first child, a son, Arthur John Thurston who was born on 29th July but survived only eight hours. The parish record shows that the family lived at what was described as The Rectory Cottage. Sadly their second child had a similarly short life. Stanley Thurston was born in December 1892 and died only three days later. He was buried on 15th December 1892. One can only imagine their feelings when their third son was born. Edward Henry was baptised on 4th March 1894. The parish records describe the property as Vicarage Cottages. A fourth child, Augustus Bevys was baptised on 5th March 1899. The 1901 census called the property Old Rectory House. It still appears to have been divided into two households. Henry (or Harry as he was known) then aged 34 lived with his wife Amy and their two sons Edward aged seven and Augustus aged two. 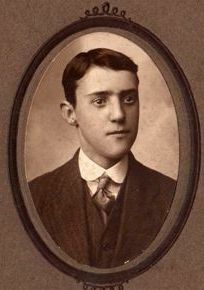 Harry’s brother Bevys aged 21 lived with them and was a draper’s assistant. The second household consisted of two rooms and was occupied by Amy’s parents George Soule aged 70 from Hull in Yorkshire and his wife Millicent aged 66 from Marylebone in London. It appears that the Soules didn’t live there long. They both died in the Worcester area in 1910. The 1911 census shows that the house was occupied by Henry Josiah Thurston a carpenter aged 44 who had been married to his wife Amy for 20 years. They had had four children of whom two had survived; Edward Henry Thurston aged 17 an office boy at a solicitor’s office and Augustus Bevys Thurston aged 12. At this time the house was described as Rectory Cottage and described as having six rooms. The trade directories continued to show that Harry and Amy lived here and that Harry was a parish clerk and a carpenter. We have above on the right a photograph of Amy Thurston nee Soule. Harry and Amy Thurston continued to live in the house for the rest of their lives. Harry died on February 8th 1939 aged 72. He had been parish clerk for 53 years, since he took over from his father at the age of 19. He had also been a bell-ringer, a member of the choir and a member of the Gleemen. Probate was granted to his widow Amy. His estate was valued at £613. Amy died August 11th 1953 aged 83. Edward Henry Thurston. Records on the Find My Past website show that Edward joined the Royal Army Medical Corps in September 1914. Sadly we know nothing about his army career. Apart from this it appears that he lived with his parents until 1927 when he married Margaret Fidoe. The Electoral Rolls for 1931 up to 1965 show that Margaret and Edward lived at the Old School House at the edge of the glebe, yards from his family home until his death aged 72 in 1966. We have been told that “Harry” Thurston as he was known may have been the caretaker at St Mary’s School. Gus Thurston. Augustus Thurston was always known as “Gus”. He was born on 25th January 1899 and was the son of Henry and Amy Thurston (see above). When he was enrolled at St Mary’s School in 1902 his address was described as “Church Field” which we assume to mean Glebe Cottage. He applied for exemption from World War I on the grounds that he was “very delicate and unable to undertake hard work.” We have a photograph here on the right that is said to be of Gus Thurston in 1915. We know that eventually at least Gus did serve in the army as his record shows that he served in the Hampshire Regiment and the Oxford and Buckinghamshire Light Infantry. In 1917 when he made the application for exemption he had been working as a footman for three months. His previous employment was at Hatherop Castle Fairford. Hatherop is about eight miles from Cirencester in Gloucestershire. 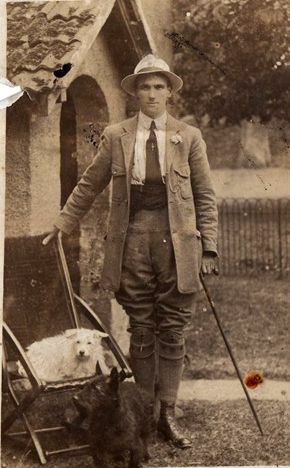 The photograph on the left hand side was taken from the Ancestry website and is said to be of Gus Thurston who appears to be standing outside of The Pound near the Church in Thornbury. Please click on it for a larger image. The 1935 electoral register shows that he lived in the Old Rectory with his parents Henry and Amy Thurston. The register compiled in 1939 in the advent of war shows that Amy and her son Gus were living in what was then described as the “Old Vicarage”. Gus was a gardener and A.R.P. messenger. The 1946 and 1950 electoral register show that Gus continued to live there with his widowed mother. In 1954, 1961 and 1965 he was living there alone. Interestingly the register of 1939 also shows another couple lived in this property. It is not clear whether they were lodgers or whether they lived in a separate household. They were Herbert Penn (born 26th May 1889) and his wife Annie (born 4th June 1884). Herbert was a Secretary to the Norrey King of Arms. At this time Norrey King of Arms was Algar Howard who was living at Thornbury House. Herbert Penn was a clerk when he married Annie Elizabeth Scott on 2nd August 1913 in Kennington, London. “opposite the church was the Glebe field, with the verger’s cottage at the back, just by the Fairfield garden. Gus Thurston was the verger – a great character. He was tall and thin with a rather grey face, and very kind to us children. When I stayed at Fairfield with our baby son, I would take him to church in his pram and Mr. Thurston would keep an eye on him in the churchyard while we were at the service. He would also act as butler if we had a formal dinner party, and my mother was always amused that he served people in strict order of precedence!” Presumably this was the result of his earlier career in service as a footman. Gus appears to have worked at other events in a similar capacity. In the photograph on the left he is in evening dress but his companions, amongst them Dennis Thompson (baker and caterer) are less formally dressed. We assume that Gus was acting as a waiter to a catering event organised by Mr Thompson. .
Gus Thurston died at Eastington in the December quarter of 1969 aged 70 and was buried in Thornbury on 1st January 1970. Eileen Williams. We do not know when Mrs Williams became a tenant of this house but the Electoral Roll shows that she was there by 1975 until at least 1980. We understand that Mrs Williams took over many of the duties of church sexton. It was sold by Christ Church College in the 1980s and enlarged. The glebe field was sold with it.